Openredu is a private social network that educational institutions and businesses can use to promote collaborative learning and knowledge management. The user experience with Openredu is its main advantage. Their interfaces are designed for teachers and students do not need training when they start to use the environment. Their model combines the features of a Learning Management System (LMS) and a social network. Elias Vidal ; GOMES, Alex Sandro ; Flávia Veloso ; ALVES, S. V. L. . Análise da prática docente com rede social educativa na disciplina de Programação Orientada a Objeto. In: II Congresso Brasileiro de Informática na Educação – XIX Workshop de Informática na Escola, 2013, São Paulo. Anais do WIE 2013, 2013. p. 12-20. BEZERRA JUNIOR, E. V.; GOMES, A. S.; SOUZA, Flávia Veloso de. Mediating Social Network Education Teaching OOP. American Journal of Educational Research, v. 2, p. 204-207, 2014. 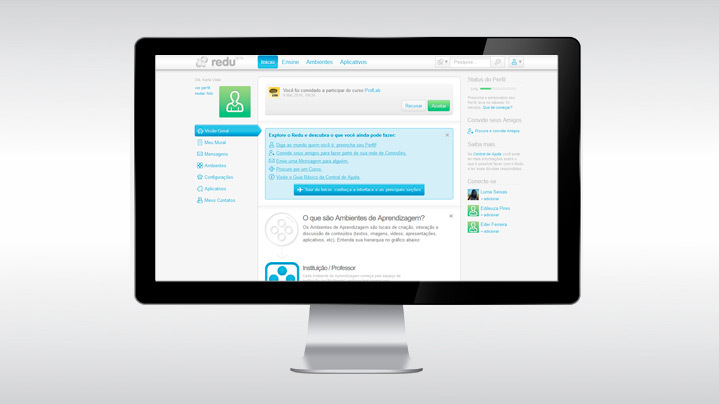 The second advantage of Openredu is the possibility of integrating it with all legacy systems of the institution via its API (application program interface) whose documentation is in developers.redu.com.br. The third advantage is in flat integration with mobile applications. In one of them the teacher can create materials in image formats, photo and video and share with their students using mobile only. Experience with applications also require no training to start using. A fourth advantage for enterprises is that it’s a free software. Your community is organized in openredu.org. This type of license allows the customer does not depend on just one supplier, staying with the one that best meet their demands without the need to switch to another product.